There's no need to spend a lot of money on a haircut and hair color. In this article, I show you 5 ways to save a ton of money on your hair. For years I spent a lot of money on fancy salons when I had the simplest haircut imaginable: Straight and long, no layers. Then I saw a friend with the same haircut who admitted she spent a whopping $15 every six weeks at Supercuts to look just like me. If you have a special haircut or complicated color, yes, you should be consulting a professional and investing money in your hairstyle. But if you want to go either a shade lighter or darker, or you have a super simple hairstyle, you could save money at the hair salon with these five tips. While highlights can be complicated, all-over color is a great do-it-yourself job for those looking for a subtle change or to cover up gray. Today's home coloring formulas are super hydrating and very user-friendly. The key to coloring your hair at home is to go no darker or lighter than a couple shades. Anything more drastic and you should go to a professional. If you're used to spending money on cut and color, consider getting your cuts done at a discount salon. This is a great option for those with simple haircuts like long, straight hair or bobs. Magazines love to tell you that if you color your hair professionally, you should get your hair cut at the same time. While there's definite perks to this, including coloring hair according to the cut (highlights on long layers, etc. ), I firmly believe if you're looking to save money you should splurge on the color and save on the cut. Why? Fixing a bad color job can be a bigger hassle than cleaning up mis-snipped ends. I love this tip I read in the book, "Confessions of a Beauty Editor," by the editors of Allure: Get maintenance haircuts in between your pricey salon visits. According to "Confessions," even beauty editors get discount cuts to save money. They suggest telling the discount stylist to cut along the "map" set by the fancy stylist. One of the best ways to get a fancy haircut without the price is to set an appointment at a local beauty school. Most of the stylists-in-training are overseen by an experienced teacher so you can bet they won't make a mess of your hair. Some big salons also offer discount days or training nights. You can enjoy a pricey cut at a fraction of the price. Check out New York Magazine's list of training nights in New York City. Another option is to hair model for a salon. You don't have as much say in your haircut as you would if you were paying for it, but most stylists will stay within your perimeters. Don't pay to get your bangs done. 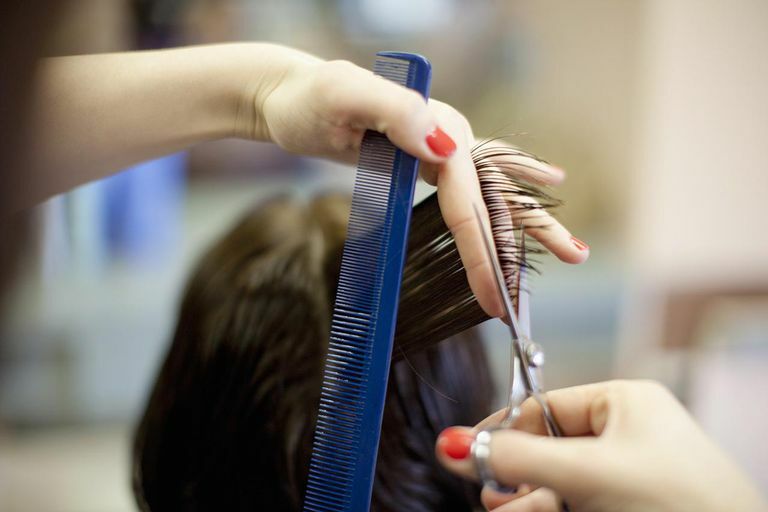 Most stylists will trim your bangs between cuts for free. You simply drop in and the trim takes less than five minutes. You can also trim your own bangs, which is an easier task than it seems. Should You Tip the Owner of a Salon? Should You Give a Holiday Tip to a Hairstylist? Are Expensive Haircuts Worth the Added Price? How Much Should You Tip for a Haircut?